A perfectly charming pair of antique guest hand towels loomed of an attractive pure white linen damask with an "œil de perdrix," (partridge eye) damask motif. Each towel is adorned at one extremity with a pretty embroidered monogram, " AS," and finished at both ends with hand embroidered scallops. Three other pairs of almost identical towels, also monogrammed "AS," can be found on the website, all of which came from the same estate. 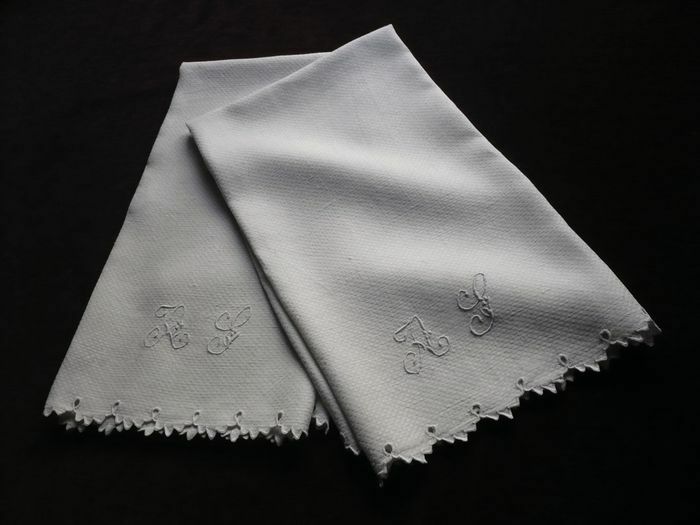 Likely dating from the 1920's, these attractive towels remain in perfect, as-new condition. Dimensions: 38 x 30.5in.